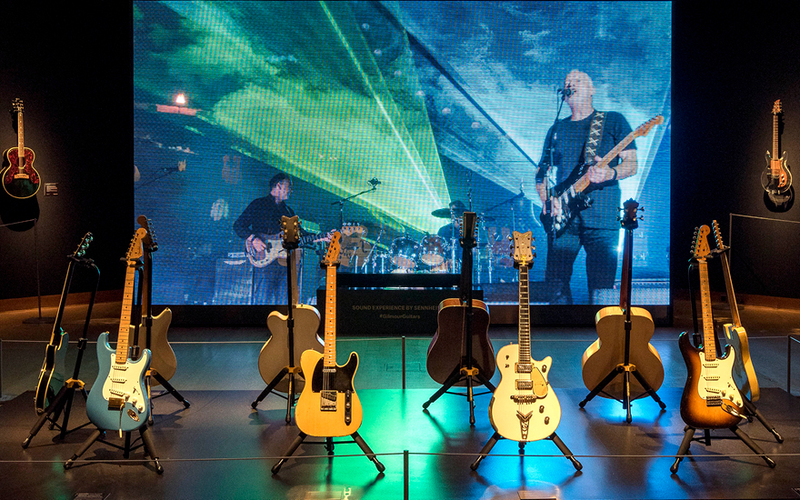 A massive collection of guitars owned by Pink Floyd‘s David Gilmour will be going up for bid June 20 at Christie’s in New York City, but you can check out many of the instruments now as part of a preview exhibit at the famed auction house. The guitars will be on display through this Sunday, March 31, but fans who can’t make it to the Big Apple to check them out in person can take a 3-D virtual tour of the collection at Christies.com. Check out the video below. The 73-year-old Rock & Roll Hall of Famer purchased the guitar in 1970 at Manny’s Music in New York, and used it throughout his tenure with Pink Floyd, as well as for his recent solo albums. It’s expected to fetch between $100,000 and $150,000. In a new Q&A posted on Christies.com, Gilmour shares some details about the history of his experiences with various guitars. In the piece, he admits the Stratocaster was his dream guitar because Hank Marvin of the influential U.K. instrumental group The Shadows played one. He also recalls that he was playing his Black Strat when he came up with the famous four-note riff of “Shine On You Crazy Diamond” while in a London rehearsal room with his Pink Floyd band mates. “[S]omehow [the notes] fell out of the guitar,” he says.